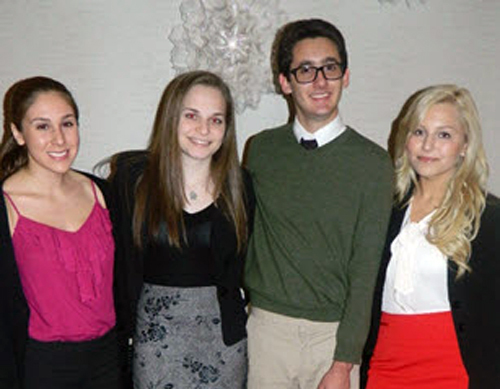 Isabella Muncan with the other 2014 student ambassadors. Photo Courtesy of The Broward League. Junior Isabella Muncan was recently selected as one of four student ambassadors from throughout the county for the Broward League of Cities. The student ambassador program encourages students who are interested in government and political science to learn about and participate in public service at a local level. Muncan first heard about the program through former Cooper City Mayor, Debby Eisenger and Cooper City Commissioner James “Jamie” Curran when they visited her classroom earlier in the school year. Having already been surrounded by politics as a fellow for “Organizing for America” and an intern for Congresswomen Debbie Wasserman-Schultz, Muncan knew the program was right up her alley. “I wanted to get more involved in government and being a student ambassador for the Broward League seemed like the perfect opportunity to see the inner-workings of our local government,” Muncan said. The application included two essays; one personal statement and an open ended question about government. After reviewing all of the applicants, the Broward League narrowed it down to semi-finalists who were interviewed. In early December, Muncan found out that she was chosen to be one of the four student ambassadors. As part of the two-year program, Muncan will have the opportunity to meet with elected officials and attend general membership meetings, board of director meetings and workshops for legislative advocacy. In addition, the ambassadors are also required to write a monthly “My View” column discussing discuss a current event issue. The columns are posted on Broward League website and are shared through social media. Each month, one student ambassador is asked to read his or her My View column aloud during a general membership meeting, giving them the opportunity to have his or her voice heard among elected officials, business leaders and community members in attendance. “We hope the program will foster each student’s passion for public service and leadership, and that their involvement in the Broward League of Cities will continue to influence them for years to come,” Broward League Interim Executive Director Sely Cochrane said. Current Student Ambassador and McFatter Technical senior Brian Mazur says the program does a great job of giving students who are interested in public service an insight into the intricacies of local government and how much work goes into running our cities and towns safely. “The Ambassadors are able to appreciate the work of local public officials while learning how they can make a difference, both as students and as future leaders,” Mazur said. Furthermore, Mazur says the experiences he has had from the program have been invaluable. “I was able to go behind-the-scenes one day and attend a meeting exclusively with local public officials regarding the consolidation of 911 Call Centers in Broward County. Watching everyone debate about such an important topic and seeing how much our local public officials cared about our safety was a memorable experience,” Mazur said. As for Muncan, she is most looking forward to meeting with elected officials and seeing how they meet and get things done. She hopes the experience will only further her passion for government and lead her to success in her future career. “Broward is a large county with about 31 municipalities, so getting things done requires a lot of compromise. I think I can learn from that,” Muncan said. “After I graduate high school, I want to be a White House Intern and eventually a legislator in Congress,” Muncan said.